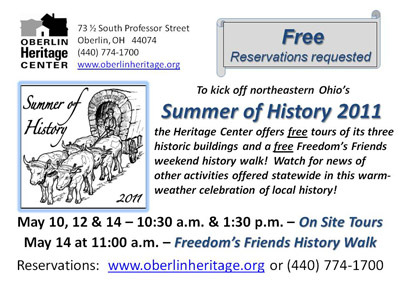 Week of May 10 - To celebrate the kick-off week of northeastern Ohio's "Summer of History 2011," the Oberlin Heritage Center will offer free tours of its three historic buildings at 10:30 a.m. and 1:30 p.m. on Tuesday, Thursday and Saturday, May 10, 12, and 14. On Saturday, May 14 at 11:00 a.m., a free Freedom's Friends history walk also will be offered. Registration for all tours is requested. Watch for news of other activities being offered statewide in this wonderful warm-weather celebration of local history.